Previewed at: Chauvel Cinema, Paddington, Sydney, on 25 April 2018. Paul Damien Williams’ documentary Gurrumul gives viewers the opportunity to be transported on a powerful spiritual and musical journey that resonates long after the film is over. According to Aboriginal culture, the name and image of the recently deceased must be retired from use but a very rare exception has been made by Gumatj and Gälpu clan leaders for this film about the renowned musician Geoffrey Gurrumul Yunupingu. This unique, extraordinary artist, blind since birth, passed away in July 2017. The leaders felt it was important for Gurrumul - whose totems are the saltwater crocodile and the rainbow python - to live on through his music so that he can continue to inspire not just the Yolngu community but all Australians and the rest of the world. Gurrumul was born on Elcho Island off the coast of North East Arnhem Land and, being blind, relied on the support of his family and the wider community. He took up guitar playing at an early age, influenced by the music of his clan’s traditional songs and local church services. As a young man he was one of the members of the famed Yothu Yindi band - comprised of both indigenous and balanda (non-Aboriginal) performers - who came together in 1986 and used Yolngu traditional manikay (songs and music) in some of their compositions. They were an impressive addition to the flourishing Aussie music scene of the period. The young singer/songwriter and guitarist’s next endeavour was as a fundamental part of Saltwater Band, a group of young men from Elcho Island whose songs were often sung in language and it was during this period that Gurrumul’s beautiful voice was given more prominence. A few years later he was encouraged by Michael Hohnen, a musician from Melbourne who’d established a music workshop in the Northern Territory, to go solo, as Hohnen had spotted a unique talent in the unassuming, quiet player in Saltwater Band. Together with his Skinnyfish Music label partner, Mark Grose, Hohnen recorded indigenous bands and took them on tour around Australia. Ultimately, Grose became Gurrumul’s manager and Hohnen his musical collaborator and, collectively, they went on to conquer the world, musically speaking. 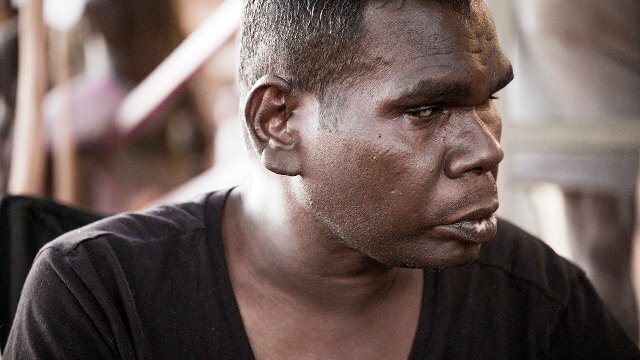 Gurrumul was a man of few words and Hohnen often became his voice (the two men called each other wäwa - brother), particularly when Gurrumul was being interviewed and the film shows the complete trust and respect the pair had for each other. Gurrumul looks spectacular. There are fabulous scenes from the four cinematographers (Gavin Head, Dan Maxwell, Katie Milwright and Matt Troll) that encompass the magnificent country, the dancing and singing traditions of the Yolngu and Gurrumul’s impassive face. Stylistically, Williams’s documentary is impressive too. In places the screen is black, reflecting the subject’s blindness. The director explains, “At these times there’s a sense of the world being aurally heightened. Our perspective shifts, our attention is drawn to things we might otherwise overlook, we begin to hear sounds within sounds, and we focus in on the world in an aural way. Then darkness. There is only sound.” Statements to camera by Gurrumul’s aunt, Susan Dhangal Gurruwiwwi, and other members of the Elcho community verify the importance of country and tradition and this is another key element of the film. To quote Williams again, “…the depth and breadth of Gurrumul’s culture needs to be revealed to our audience incrementally, with increasing sophistication as their sensitivities to its nuances develop. I want to leave them with the sense of awe that I felt when I came to understand just how deep the flowing waters of their culture ran.” Sadly, Gurruwiwwi speaks prophetically of the pages turning on her nephew’s life and the necessity to keep his music alive, so that future generations will be inspired by one of their greats. If you missed out on seeing Gurrumul perform live, unlike Queen Elizabeth and Barak Obama, then you’re in for a treat - this is music at its finest and it makes your spine tingle. We are taken on a very personal visual ride with this film. It’s a tribute not only to the special talent of an inimitable, original musician but also for the music and tradition of his awe-inspiring, ancient culture.